If you think your dog has what it takes to succeed in agility trials, it's a good idea to invest a little money in some cheap dog agility equipment and see if your hunch is right. Participating in agility training can be great fun for you and your dog, and you'll never know just how talented your canine companion might be unless you give it a try. There are many types of dog agility equipment. If you try to purchase a complete agility course all at once, you'll find yourself spending a significant sum of money. When you're just getting started, it's a better idea to purchase a few basic pieces that are used in most competitions. Once you see how your dog adapts to agility exercises and activities, you can assess whether investing in more advanced training equipment is a wise decision. In the beginning, stick to the basics and shop around for the best prices on the equipment you decide to purchase. Just about every agility competition utilizes a bar jump of some type. When you're just beginning to work with your dog, the best choice is an inexpensive adjustable bar that you can use for various training activities. The United States Dog Agility Association (USDAA) uses 20" inner diameter tire jumps. The American Kennel Club uses 24" inner diameter tire jumps. The North American Dog Agility Association (NADAC) requires the tire jump to have a 20" to 22" inner diameter. United Kingdom Agility International requires an 18" inner diameter. No matter which competition you plan to participate in, if any, it's best to begin training your dog with the larger option. If you plan to enter USDAA trials, you can always move to a smaller tire later in the training process. Tunnels are also an important component of a dog agility training program. When you start shopping around, you'll notice that retailers carry both practice and competition tunnels. When you're looking for cheap dog agility equipment, it's best to stick with practice tunnels. It isn't as sturdy as the competition model, but works fine for recreational training purposes. If you've ever watched a dog agility trial on television or in person, you have witnessed the beauty of a skilled and well-trained pup weaving in and out of the poles. As much fun as it is to watch dogs that have mastered this feat, it's important to keep in mind that this is a difficult skill for dogs to master. You can start out by purchasing six poles, but as your dog becomes more advanced, he or she will need to practice with a total of twelve. With so many types of equipment needed for comprehensive dog agility training, it's easy to see why it's important to make wise decisions when it comes to purchasing the items that you need. If you shop wisely and purchase only a few items at a time, you'll be able to find cheap dog agility equipment that meets your dog's training needs. If you're handy, you can save a significant sum of money with dog agility equipment DIY projects. You can purchase dog agility equipment kits which are cheaper than the professional versions and require just some assembly on your part. Affordable Agility in a Bag retails for about $229 and features several of the items you'll need to start training for agility. There's an adjustable bar jump, a weave pole set, and a tire jump. The kit also includes a "pause box" that is basically a square PVC frame and not a table as you'll find in a competition. The kit also includes a tunnel with a chute that is removable. The downside of this kit is that the tunnel is only 3 feet long and the chute part of it is not useful as most major agility organizations removed the chute from the approved obstacles list for competition. The kit also would not work well for a very large dog but is suitable for most breeds and sizes. It's made of PVC and is lightweight and easy to assemble. 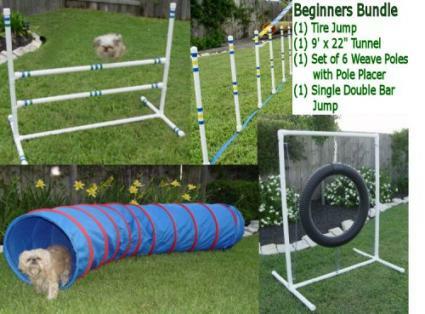 Weave Poles Dog Agility Equipment Beginners Bundle can be purchased for around $340. It contains a tire jump, single/double bar jump, weave pole set, and a tunnel. All the items in the kit will work for any size dog and the assembly is not difficult. The weave poles are "stick in the ground" so you'll need to be able to have a space for this outside. Everything is constructed from heavy duty PVC. The Outward Hound Zip and Zoom Outdoor Dog Agility set is made of much cheaper material than the others and retails for only about $33. This kit is a good choice if you haven't decided if you want to get serious about agility and just want to try it out with your dog. It also can work well with training smaller dogs who won't cause as much wear on the less sturdy equipment as well as using for puppy socialization. The kit includes a small tunnel, tire jump, and weave poles that stake in the ground. There's also an Indoor kit retaining for about $21 that has bases for the weave poles and jumps so you can set them up on a floor. If you're handy, you can save a significant sum of money doing dog agility equipment DIY projects. Gone to the Snow Dogs has extensive instructions on their website for making jumps from PVC that include the ability to adjust the bar heights which is important if you're working with different sizes of dogs. Another excellent set of plans for building a seesaw, as well as weave poles and an A-frame, can be found on the DIY Network website. These make use of wood and PVC as the major materials. 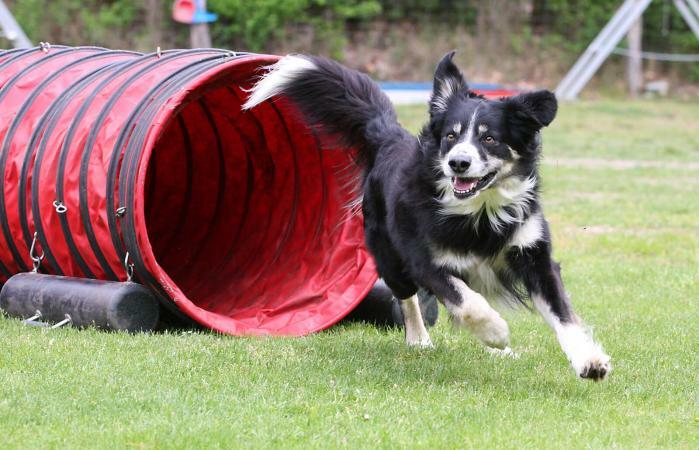 Affordable Agility carries tunnels, jumps, weave poles, seesaws, tables, A-frames, dog walks and even some non-agility obstacles such as cavalettis, crawl tunnels and ladders. They also carry agility equipment designed for the specifications of the Teacup Dog Agility Association (TDAA). They have a wide selection of items for both the beginner who's on a budget and the experienced pro looking for higher quality equipment. Agility by Carlson carries all the major pieces of equipment including jumps, weave poles, and tunnels. 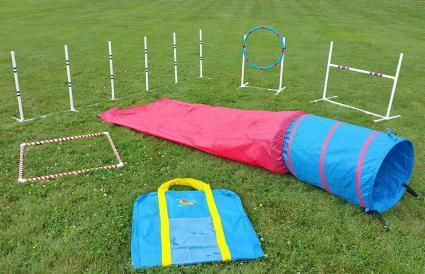 All equipment is made by Agility by Carlson to order and can be built for the beginner through experienced competitor. They also have starter kits for people who aren't sure what to purchase but want to get started in agility with their dog. Clean Run is a major site of dog agility information. In addition to selling agility equipment and training supplies, they publish the well-known Clean Run magazine for agility enthusiasts and competitors. You can purchase everything from obstacles to training treats, toys and competition supplies, as well as agility training books and DVDs. Northwest Agility makes many of their agility equipment by hand using PVC pipe and in some instances, metal bases. They have economy and professional options for most types of equipment. Amazon is a good source for cheaper, beginner dog agility equipment, such as starter kits, tunnels, and affordable agility jumps. Major pet store retailers like Petco and PetSmart do not tend to carry agility equipment, other than very basic starter options and cat tunnels which can work for toy or small dogs. They are a great source though for toys, treats and clickers which you'll need to get your dog started in training for agility! 4H clubs also hold agility programs for children and adolescents and they may have equipment they are looking to sell to upgrade their own. Find local 4H dog programs in your area via their website. If you're ready to start agility training with your dog, all you need to do is purchase or build a few basic pieces of training equipment, and you'll be ready to start. You might want to rent or purchase a dog training video to help you get you started. In no time at all you and your pup will be spending quality time together, enjoying agility training activities using equipment that didn't cost a fortune to put together.